ALLAMUCHY — On the weekend of April 8-10, Venturing Crew 276 of Byram Township attended the first-ever AdVenturee camping event, hosted by Mount Allamuchy Scout Reservation and run by members of the Patriots’ Path Council Youth Executive Committee and the Mount Allamuchy staff.The AdVenturee was a camping event open to members of council Venturing crews or Boy Scouts of Venturing age. Attendees could provide their own food or enjoy meals courtesy of the Mount Allamuchy staff. The snow made the team-building exercises at the COPE (Challenging Outdoor Personal Experience) area more intensive. However, the snow had little effect on the ATV course, where participants were trained in an ATV safety course as they mastered driving the vehicles. There were also some less challenging but still fun activities including archery, land navigation, and candy and dessert a making. The pistol shooting station was open only to members of the Venturing program and allowed participants to shoot a revolver and several different types of semiautomatic pistols. If the snow was too much for some scouts, the dining hall was open all day for venturers and scouts to get warm. The AdVenturee also hosted a camp-wide race. There were challenging tasks like a mind puzzle, laser maze, and Kim’s challenge. 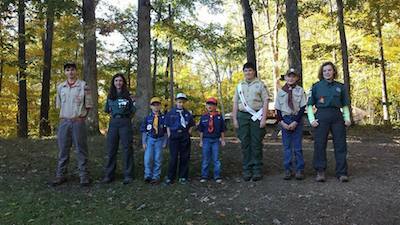 There was also Boy Scout trivia and even super hero trivia to go along with the weekend’s theme! Crew 276 even came in first place! Congrats to the members of the team. After a delicious dinner of ham and macaroni and cheese, the camp hosted a campfire program, where each crew was invited to perform a skit and two songs. Unfortunately, the campfire had to get moved inside to the Dining Hall due to the snow. Overall, the weekend was amazing and for the YEC’s first ever AdVenturee, it was a major success! Crew 276 would like to thank both the YEC for assembling such a fun event and Mount Allamuchy Scout Reservation for the use of their beautiful facilities. Crew 276 would like to thank the members of the Mount Allamuchy staff for providing the use of their excellent facilities and providing hot food for the weekend. We also would like to thank the Patriots’ Path Council Youth Executive Committee for organizing and running this fantastic event. 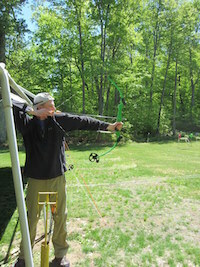 Stephen R. helping a scout properly hold a bow. Image courtesy of Venture Crew 276. 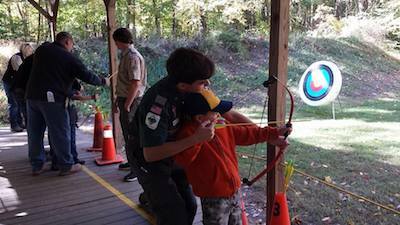 BYRAM TOWNSHIP, NJ- Venturing Crew 276 of Byram, New Jersey recently attended the 2015 Sussex District Fall Cub Scout Camporee, hosted by Mount Allamuchy Scout Reservation. from left to right) Scout, Katie R., three cub scouts, Alex M., and Emily B. Image courtesy of Venture Crew 276. The Crew members volunteered their time to help run some of the activity stations for the young Cub Scouts. Some of the stations our crew members ran included COPE and rock climbing, fishing, science and sublimation, BB gun shooting, archery, nature hikes, and a zip line. 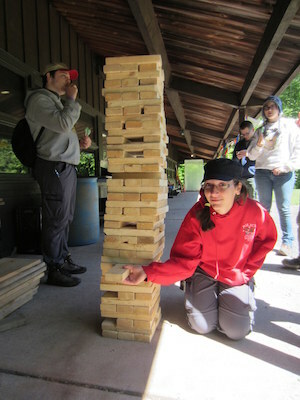 Other activities offered throughout the camp were mountain biking and totem pole carving. When the crew arrived Friday evening, it was muggy and rainy out, but that doesn’t stop a Boy Scout! Fellow campers treated them to a late night snack of hot dogs and French fries before Crew 276 returned to their cabin for a few rounds of Apples to Apples (a crew favorite). The next morning, the entire camp met at Voller’s Field for morning flags. Conducted by members of the crew, the American Flag was saluted and raised. Vice President of Fundraising, Christopher Rozek, played the trumpet calls, as he did all weekend. Throughout the day, programs, as afore mentioned, were run. The Cup Scouts took a particular liking to the BB gun range. At dinner time, the camp was served a fantastic spaghetti and meatball dinner, courtesy of the Mount Allamuchy staff. After dinner the camp gathered at Council Point for the evening campfire. Packs and troops had the opportunity to perform skits and sing songs for the entire camp to get involved in. 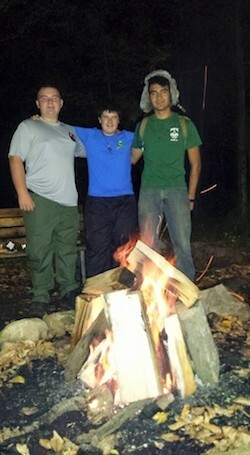 John Z., Alex M., and John U enjoying the last night and last campfire of the camporee. Image courtesy of Venture Crew 276. It is most definitely a time of laughter and silliness. The campfire held a more serious note as the night progressed. For the second time, Crew 276 performed a flag retirement ceremony. At their previous meeting the flags were saluted and then cut up into stripes and stars. Each person present at the campfire was given a piece of the worn out flags to place on the fire and be burned until unrecognizable. Crew member Thomas Seltzer read the order of the states as they joined the Union while people filed down the aisles and placed their piece of flag in the burning fire. The next day the grommets were dug out of the ashes. Katie R. helping scouts on the rock climbing wall. Image courtesy of Venture Crew 276. As usual, the Cup Scout Camporee was a fun and exciting experience for both the Cub Scouts and the Scouts that helped run the stations. 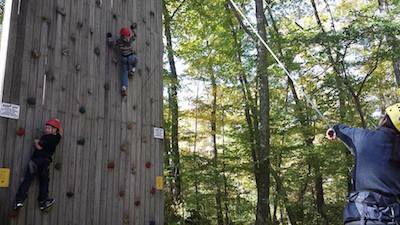 I, personally, cannot wait to attend the Spring Camporee again in 2016. I would also like to thank the Mount Allamuchy staff for the use of their beautiful facilities and to Carlos for organizing the event. SPARTA, NJ – Patriot’s Path Council of the Boy Scouts of America announced today that NASA Astronaut Lee M. Morin will serve as a keynote speaker at the 2015 Liberty Jamboree – where more than 5,000 Scouts from across the northeast will gather in Liberty State Park from October 2 to 4. Local scouts will be attending this event from Venture Crew 276 and Troop 150. According to Patriots’ Path Council Scout Executive, CEO Dennis J. Kohl, “We are honored to have Dr. Morin speak, inspire and serve as a role model for our Scouts.” Mr. Kohl noted that Dr. Morin’s presence will also support the emphasis on Science, Technology, Engineering and Math disciplines that will be featured at the Scout Jamboree. Lee M. Morin, M.D., Ph.D., Captain US Navy, Retired was selected as a NASA astronaut candidate in 1996 and took part in the 13th space mission of the shuttle Atlantis in 2002 as it traveled to the International Space Station. After the Atlantis mission, Dr. Morin served in the State Department as Deputy Assistant Secretary of State for Science, Space, and Health in the Bureau of Oceans, Environment, and Science. He is currently assigned to the Exploration Branch of the Johnson Space Center, where he is working on NASA’s newest spacecraft, the Crew Exploration Vehicle. In addition to serving as one the keynote speakers at the Saturday evening show, Dr. Morin plans to meet and interact directly with Scouts throughout the day. The Jamboree program is jam-packed with exhibits, hands-on activities and demonstrations involving more than organizations, companies and institutions of higher learning. Christopher Rozek said, "I am looking forward to meeting new scouts from around the area and to participating in the various STEM related activities at the Jamboree." Stephen Rozek of Venture Crew 276 said, "Crew 276 is very excited to be attending the Liberty Jamboree. In preparation for the Jamboree, we have already participated in two cleanup days. The cleanup days are a full day of community service dedicated to improving Liberty State Park. "These cleanups are one of many ways that Scouting gives back to their community and nation," said Rozek. The Patriots’ Path Council, Boy Scouts of America, Council #358, is a not-for-profit organization dedicated to preparing young people to make ethical choices over their lifetime by instilling in them the values of good character, citizenship and personal fitness. Each year, the council serves more than 16,000 youth members and 5,000 leaders in the counties of Morris, Somerset, Sussex, Union and parts of Middlesex, New Jersey. Some 400 local organizations have a Cub Scout pack, Boy Scout troop, Venturing crew, Varsity team or Explorer post as a part of their service to youth. Byram — Venturing Crew 276 of Byram traveled to Liberty State Park in Jersey City on Saturday, Aug. 22 to participate in their second clean-up project this year. While the crew was at the park, they mulched around the trees and performed other general landscaping activities to ready the park for the Liberty Jamboree. After working all day, the crew took some time to visit a 9-11 memorial. "This monument was my favorite part of the day. The memorial is striking and reminds us all of the tragedy of 9/11 and how freedom is not free," said crew member Alex Mottola. "The venturing crew volunteered their services to give something back to the park that represents the nation's liberty and freedom." 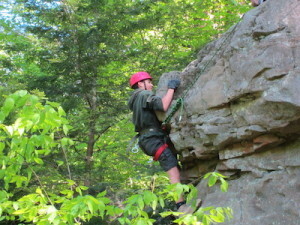 Venturing is a youth development program of the Boy Scouts of America for young men and women. ages 14-20. Venturing Crew 276 meets monthly in Byram Township at the Lakeland Emergency Squad building. More information on the crew can be found at venturecrew276.com.